French Emblems: Emblem: Animi scrinium servitus. Servitude is a cage for the spirit. The nightingale, herald of spring, Shut up in a cage, grows silent. Servitude is a cage for the spirit, And shackles the tongue with a chain. inclusam, postulat, sed desidem, non volucrem. 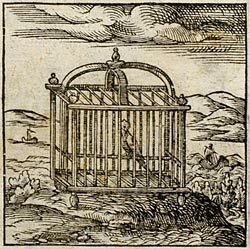 We have referred in the eighth Century of our book of Adages to a maxim taken from Dionysius Longinus, psuchês glôttokomon douleia: ‘Servitude is a cage for the spirit’. For it is a binding of the soul, [p.147] preventing us from speaking with a free tongue and freely putting into words what we think in our heart, devoted as we are to the service of the great, or at any rate kept in check by their tyrannical behaviour of putting (as it were) a bridle in our mouth, since freedom is the nurse and mother of eloquence. To be sure that tyrannical behaviour has from time immemorial come to be employed by princes, wanting to hide their crimes behind a veil of virtue, or to dress up their duplicity with a cosmetic semblance of good faith. That habit of indulging great men’s vices, confirmed by long custom and considered ethically acceptable, has corrupted the minds of writers with degenerate slavery to such an extent that there is nothing healthy in this business; that trustworthiness that is sacrosanct in history-writing is utterly dead; and detestable Busirises and monsters of depravity are well-nigh equal to gods in our minds. And on top of this someone thought up that clever penalty and punishment by which books were ordered by Senatorial decree to be put to flames, so as to gratify the [Roman] Emperors - or should I say those banes of the earth - as Seneca records of the writings of Labienus, and Tacitus of Cremutius Cordus. The emblem comes from Philostratus and draws on an image of the sophist Scopelian, who, deprecating the work demand of him by the people of Clazomenae where he opened a school at his home, replied that the Nightingale was singing in a cage. The picture is self-evident, and requires a nightingale to be portrayed shut up in a cage, but immobile, and not flying about. 2. Titus Labienus, a rhetorician in the time of Augustus, famous for his boldness and fierce temperament. Aulus Cremutius Cordus, a historian under Tiberius, known for his frankness. 3. Scopelianus of Clazomenae, a city on the Ionian coast of Asia Minor, where he ran a school. See Philostratus’ Vitae sophistarum.